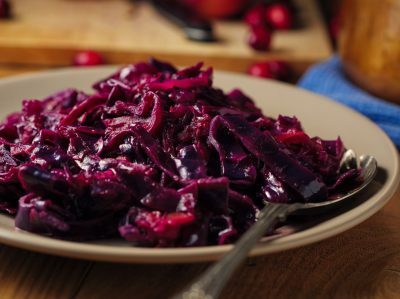 Red cabbage is often used raw for salads but can also be eaten cooked. This German vegetable dish is a favorite and can be served with Rouladen, Sauerbraten or Buletten. 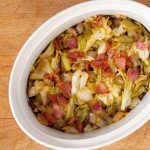 For those who find sauerkraut a little too strong or sour, Rotkohl is a sweeter, less pungent alternative. 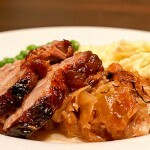 Basically a sweet-and-sour braised red cabbage, Rotkohl is very easy to make and it tastes great. Melt the butter in a large pot over medium heat until foamy and golden. Add the shredded red cabbage, grated apple and toss to coat with the butter. Sauté until slightly wilted, about 5 minutes. Add sugar, apple cider vinegar, cover and simmer. 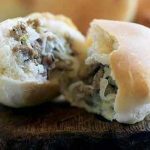 Sprinkle sugar and cloves over the cabbage and toss to coat evenly. Add the vinegar and lemon juice to the pot. Bring to a simmer, then reduce the heat to medium low. Cover and simmer until the cabbage is completely tender, stirring often, about 30 minutes total. If making sweeter version: brown the butter in a small saucepan by cooking it over medium-low heat until foamy and golden. Remove from heat and stir into cooked cabbage mixture with the lemon juice.